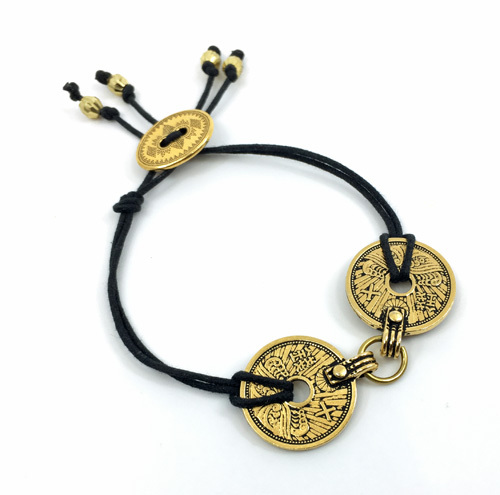 Make a Cord Bracelet Using Pendants! Too often we design using findings as they are meant to be used. Have you considered changing things up? It is a sure fire way of getting a new look! 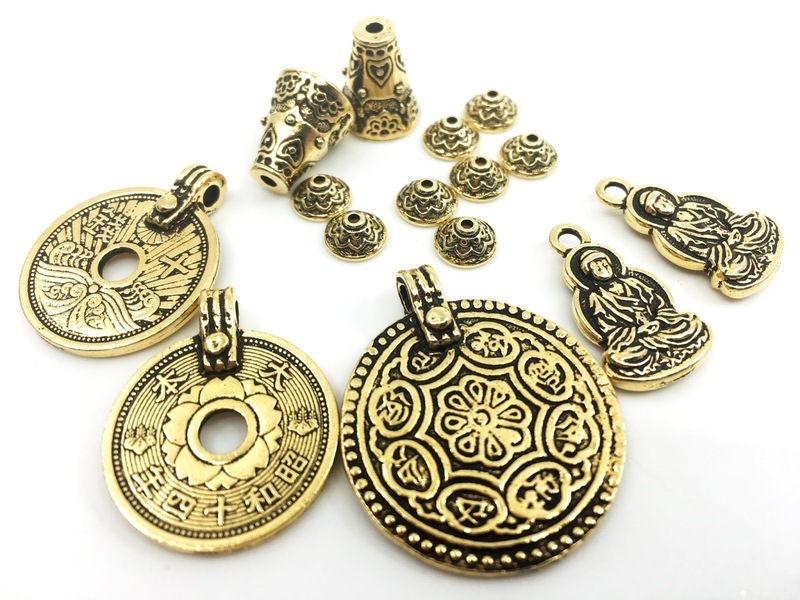 Do pendants have to be used as such? Nope. 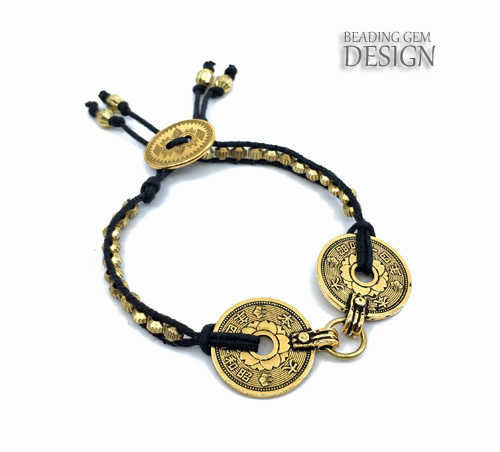 You can use some of them in bracelet designs as you can see from this latest tutorial of mine. It all started when I received Tierracast's latest Japan inspired collection called the Eastern Path. These beautifully made pewter findings are richly textured using traditional elements. I chose to work with the two smaller pendants which had holes in them. If you are not using Tierracast pendants, make sure yours has holes in the middle. If not, and you determine it is possible to do so, punch out holes in the middle. I recommend the Euro Power Punch tool for easy punching. I linked them together at the bail ends with a brass jump ring. I also found an appropriate 2 hole button for the clasp. This came from a previous Tierracast review. Tierracast findings can be obtained from many jewelry suppliers or online. You can see some two hole button selections here. I used 1 mm cotton cord - you could also use leather if you prefer. I cut 2 x 16 inch lengths. 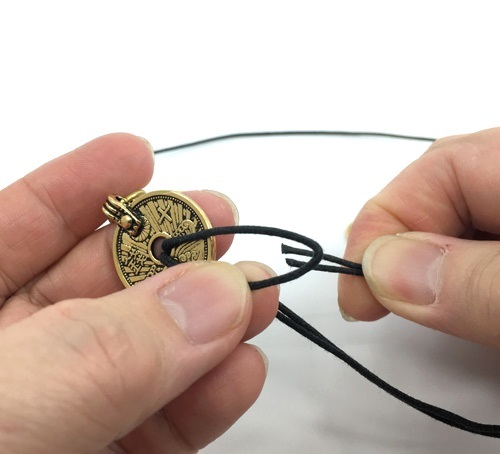 I secured one of the double up cords through the hole in one of the pendant and fed the ends through the loop. 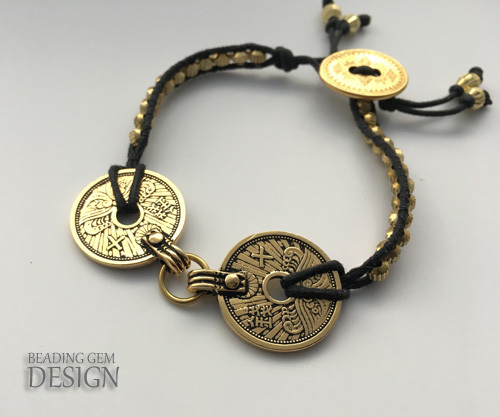 Determine the length of bracelet you want. Button end : Feed one cord up through one of the button holes and down through the other. Make a double knot so both cords are knotted up. On the loop closure end : Make two overhand knots spaced apart enough so the button can go through. Add drops of Super New Glue (not your usual Super Glue) to all the knots, let dry and trim the cord ends off. This liquid glue is much less messy than E6000 for this application. 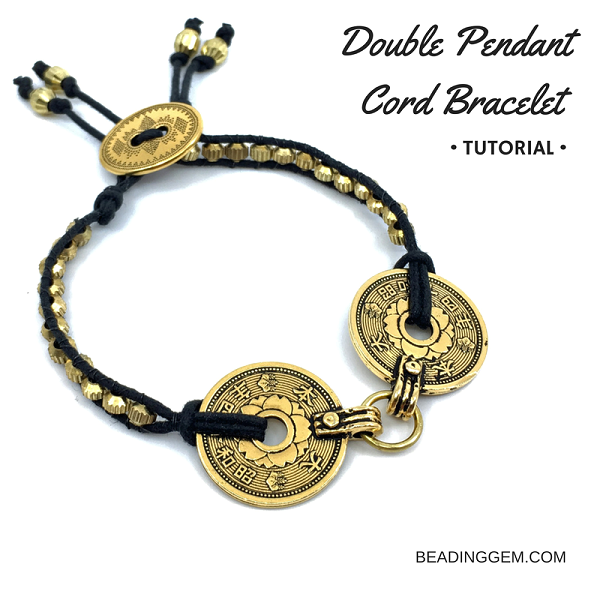 As a further design element, I chose to add additional knots and large hole brass beads to each cord end. 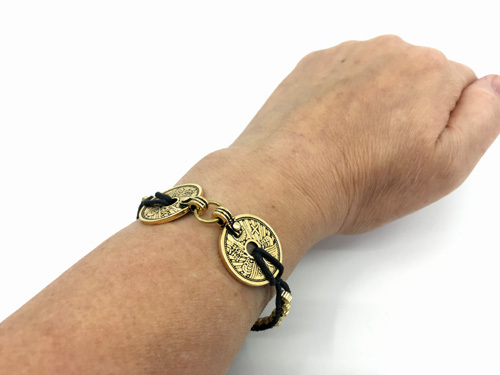 The bracelet is done at this stage. 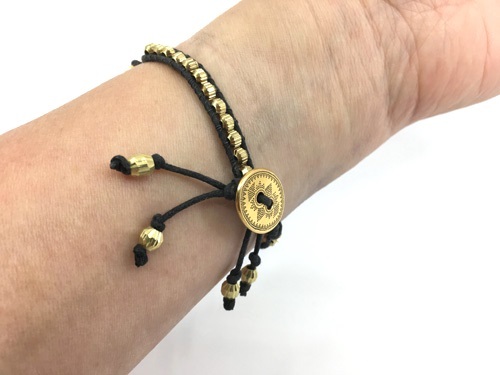 But I went one step further to make the bracelet more interesting. I cut a 3 ft length of 6 lb Fireline, doubled it up and attached it to the pendant end on one side. I then added beading needles to each thread end. 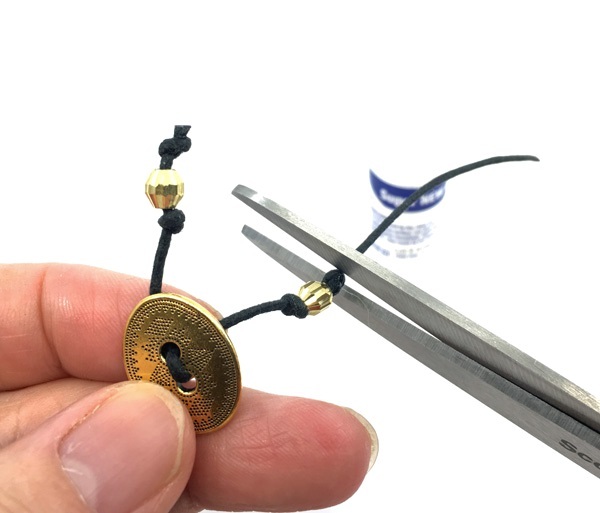 I passed each needle through small brass beads (you can also used glass beads) in opposite directions. 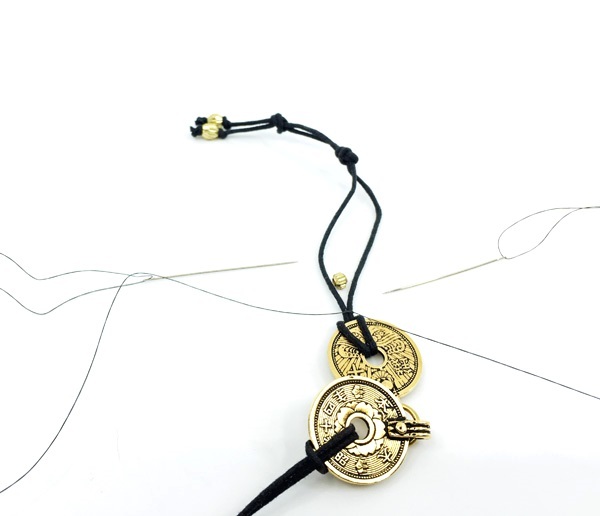 Using the needles, each thread is looped around the cotton cord and passed through the brass bead again. One more loop around the cotton cords and then the next brass bead is added on in the same manner. 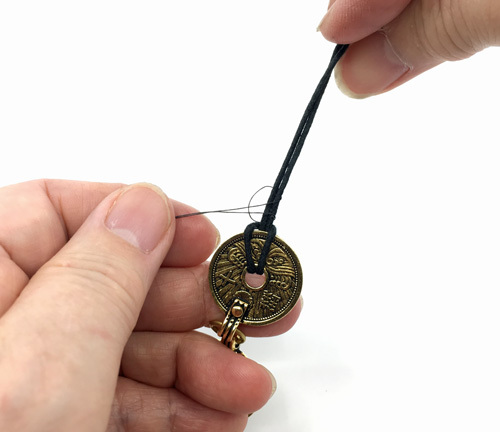 Once enough brass beads are added, bring one of the threads to the same side as the other. 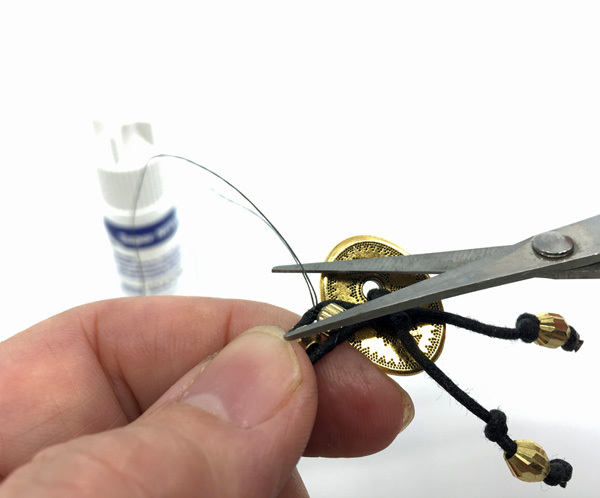 Double knot, dot with glue, dry and trim off thread ends. Add brass beads to the other side and you are done! Thank you! I really appreciate it when readers take the time to let me know if a design was any good! That looks fabulous Pearl! Great tutorial too!! I like this DIY project. I want to get it.